Not just drama but a dramatic documentary film, containing precious early footage of the titanic intelligence war between Michael Collins and British Intelligence in Dublin in1919/21. A even larger than normal crowd at this Birmingham Irish heritage Event, sat spellbound and gripped by the fast moving action in this historic footage. 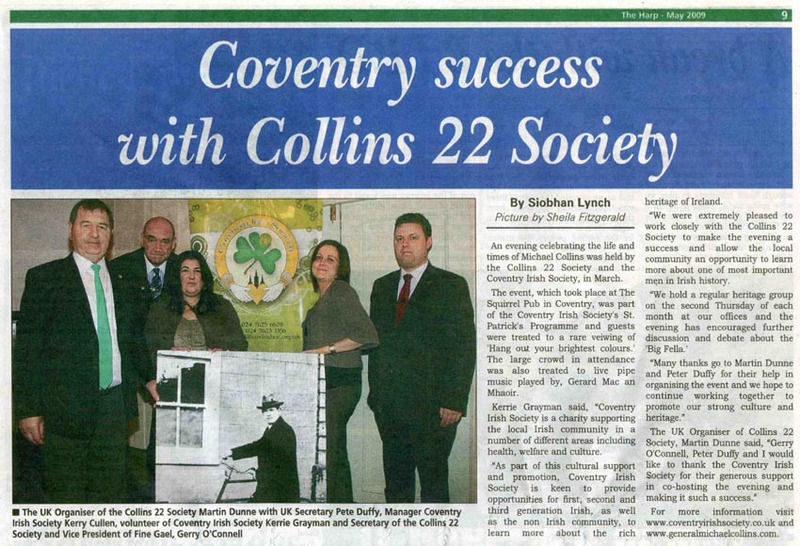 It was brought to us by the Collins 22 Society, and presented by its UK Secretary Peter Duffy and Organiser Martin Dunne, who fielded questions and prompted deep and lively debate. 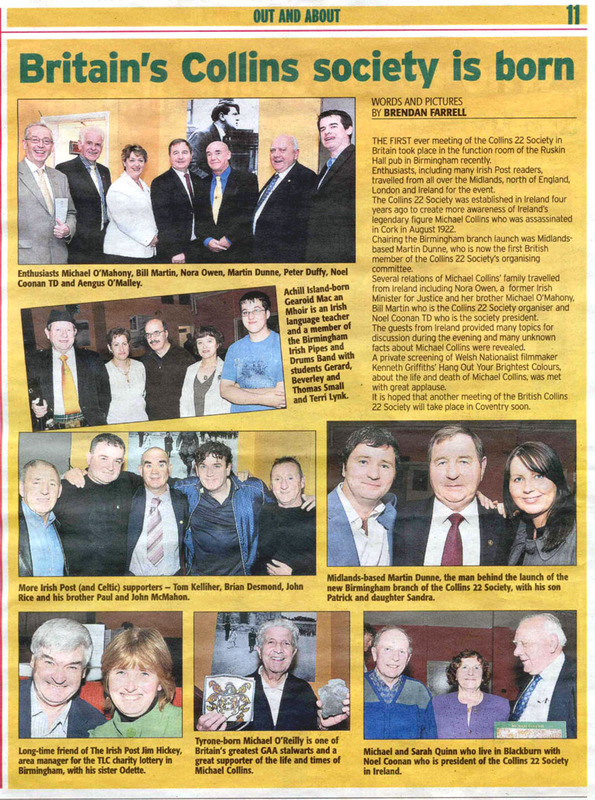 This Birmingham Irish Heritage Event was held on the first Wednesday in June 2010. Heritage Group Events are held on the first Wednesday of every month and commence at 7pm upstairs at the lrish Centre, High St. Digbeth, Birmingham. On the first Wednesday of July, that is the 7th, Birmingham Archives will be presenting their collection of very early and historic photographs of Ireland and the Irish. General public are welcome with admission and refreshments free. 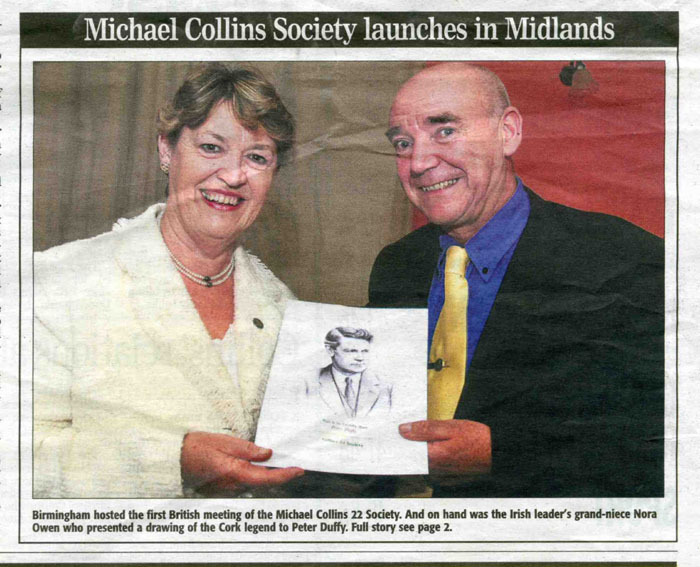 The gripping and fast moving historic film presented by the Collins 22 Society entitled ‘Get Collins’, aptly named as it was about the intense efforts of British Intelligence and Military to get Michael Collins dead or alive. We were drawn into the efforts of Collins and the I R A to win a vicious war, with each side trying to penetrate the other: for top-secret information on planned moves. The fi1m revealed intriguing detail of British efforts to identify what in today’s pop culture would be known as the “Main Man” i.e. the charismatic leader, so that they could assassinate him or strange as it may seem negotiate with him, as the opportunity presented itself. In graphic detail we were shown how one of their efforts. came to grief. A sergeant major named Jack Byrens retired in England and operating under the alias John Jameson, succeeded in persuading Irish activists in the union movement in london, that he was anxious to help in the struggle for Irish lndependence. IRA Officers were also persuaded that he was genuine, and subsequently a meeting was set up with Collins. At the eleventh hour it was discovered that his plan was to kill Collins on behalf the British, consequently he was apprehended and executed by the IRA. Strangely this was a story that brings, credit to both sides, a dramatisation of his execution was shown including the last words of this brave man” God Save the King”. 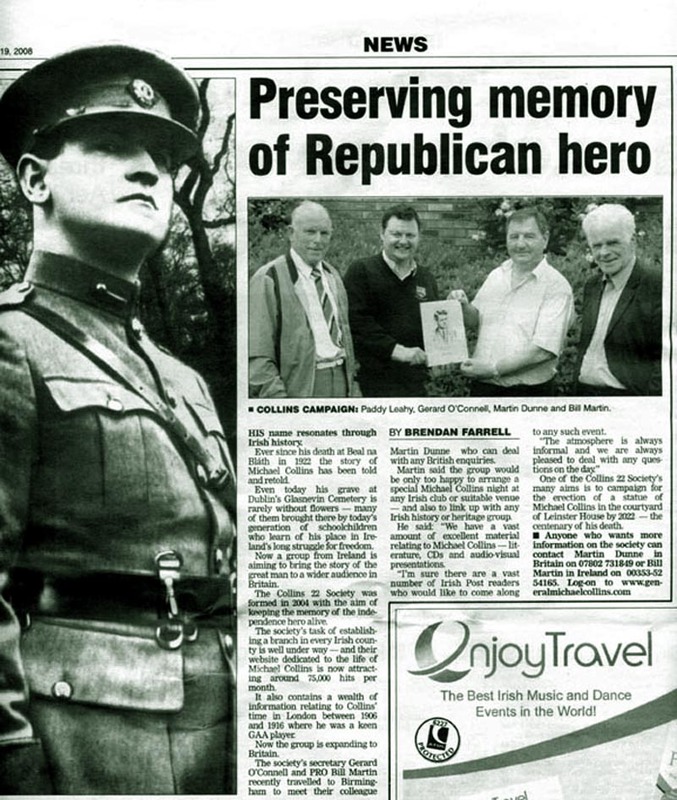 The IRA were the only ones to have witnessed this and they could have kept it hidden, but instead they put it on record, acknowledging the act of a brave man adhering to hi principles as the IRA adhered to theirs, credit due to both Sides. British Rely On IRA Analysis Subsequently this exciting film revealed. an even stranger and greater secret, a second British Agent trying to approach Collins. This part of the great story of Collins was unknown to me and probably to most of our readers. This man Andy Cope was a secret negotiator empowered by the highest levels of the British Establishment, to make contact with the number one name on the wanted list. A man with a very high price on his head, Michael Collins. A difficult and dangerous task, given that the previous approach had been from an assassin. A very risky mission for Cope whose life depended on the belief of the British that IRA intelligence would correctly analyse the situation, and understandably not shoot first and answer questions later. Bloody Sunday Collins did meet him several times, and the first steps were taken on the path to more formal negotiations, which eventually led to independence for 26 out of the 32 counties. The film drew us into these historic events, by presenting a vivid picture of how before and during the approach by the British Agent Cope, British forces rampaged through Dublin and the rest of the country bringing terror by night and day. The audience watched with baited breath the ‘truth being stranger than fiction” episode of the “Cairo Gang”, British Agents brought in from the Middle East and hidden about Dublin, on a mission to assassinate the entire top leadership of the IRA in Dublin, thus decapitating the organisation in one simultaneous strike. However Collins was one step ahead and uncovered the plan, then struck first sending his men out to make simultaneous raids, on the more than .a dozen secret addresses of the British agents, shooting 14 of them dead, on what became known as Bloody Sunday 1920. Hour’s later British forces invaded Croke Park, killing several spectators and even one of the players. All war is a grim business, and regrettably sometimes it includes getting your retaliation in first. British strategy included maximum terror, secret assassination missions, and high-level secret negotiations occurring at the same time. One of commentators in the film said it seemed like the right hand did not know what the left hand was doing as far as the British were concerned. An understandable viewpoint, but I would not be so sure, Never underestimate the British, the left hand may indeed not have known what the right was doing, but I feel sure that the directing minds at top level did. Great credit is due to Collins and his comrades in navigating their way through that labyrinth to remove 26 of the 32 counties from foreign rule. Not just any foreign rule but that of a powerful empire well practiced in the art of divide and rule.